Today I have swatches of two stamping polishes I recently got sent by Beauty Big Bang which I'm super excited about! I really enjoy trying out Beauty Big Bang's products, and BBB's stamping polishes are becoming my go to's when I do stamped designs. Until now I had only tried their solid colour stamping polishes (black, white, green & yellow), so I was excited to try a couple with different formulas. I tried one of their duochrome stamping polishes and one their holographic stamping polishes. I own a lot of duo chrome and holographic polishes, but they're not formulated to be used for stamping so I was excited to try ones that are. 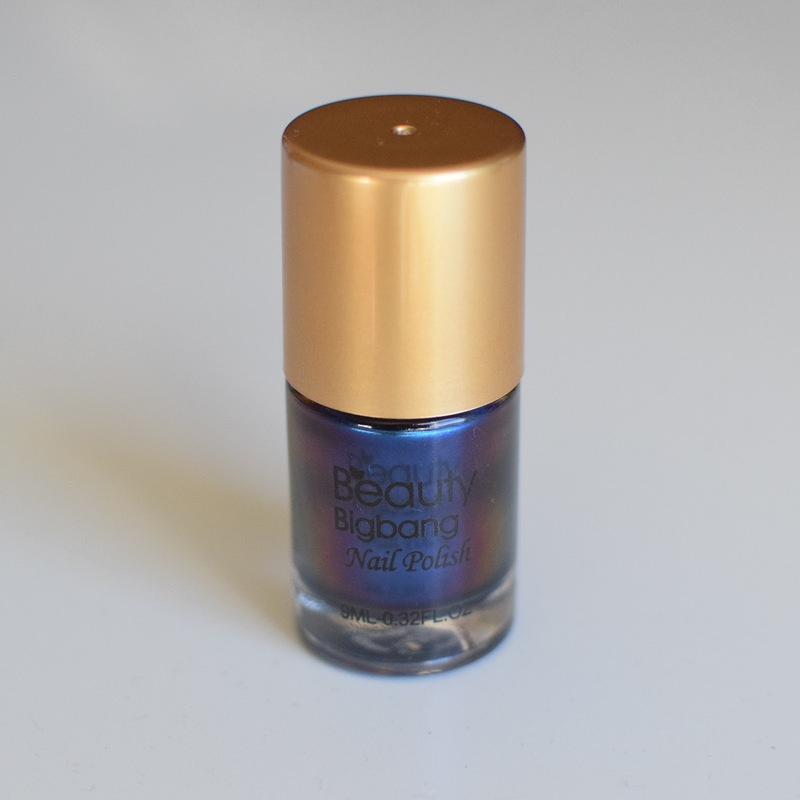 First I have 005 from the Duochrome collection, which is a darker blue shade that shifts to purple (it also has a gold shift in the bottle, but that doesn't show up as much on the nails are the purple and blue tones). Unlike the creme formula stamping polishes from BBB it is not a one-coater, it did take two coats to be opaque on the nail. The shade is a lovely medium-dark blue and is a great winter shade and I will probably wear this more as a base shade than a stamped shade. I stamped this over a white based and absolutely loved the result, it doesn't stamp as opaque as the creme shades (which I guessed would be the case based on it needed two coats in my swatch), but over white the design was completely visible but had an almost translucent look to it, which when I put a matte top coat on looked grainy and beautiful. Next is 005 from the Holographic collection and I was instantly in love with it. It's a kind of blurple shade (somewhere between blue and purple, I can't decide which it's more of so it's blurple). The shade is vibrant and is a linear holo. It took two coats to be opaque on my nails. It has a shiny finish (though it looks just as beautiful with a matte top coat). It stamps great on both dark and light shade base polishes. It does have a different look depending on the light or dark base, but I love it both ways. On the white base the base of the polish was super vibrant, on the dark base the colour was less vibrant but the holo glitter came through about better than on white. Both of these polishes are absolutely beautiful and if you are looking to add some variation to your stamping polishes collection then both of these polishes and I'm sure the others in both collections would make a lovely addition to your nail polish collection.